Everybody loves a bright white smile, and there are a variety of products and procedures available to help our patients achieve the healthy youthful look they want. If you are a candidate for bleaching. Dr. Grant may recommend an in-office procedure. This procedure is called Chairside Bleaching and is usually accomplished in one office visit. The visit may take from 30 minutes to one hour. During chair side bleaching, we will apply either a protective gel to your gums or a rubber shield to protect the oral soft tissues. A bleaching agent is then applied to the teeth, and a special light used to enhance the action of the agent. 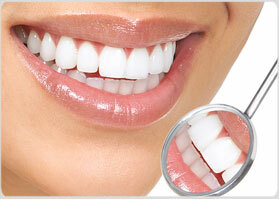 As an added feature, we will give you custom take home clear plastic bleaching trays along with a touch-up kit. These may be used at times when you feel a little enhancement is necessary.